Bathymetry of the Tui Malila vent field (25 cm resolution) on the Valu Fa Ridge in the Lau Basin. 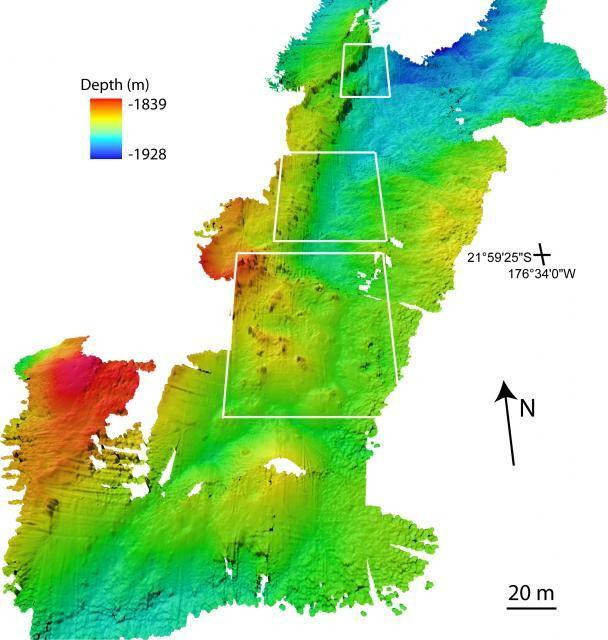 Observed areas of hydrothermal activity (identified with white boxes) are located close to a NNE–SSW trending fault scarp with 10–15 m throw. Some areas of hydrothermal activity at Tui Malilsa are associated with volcanic domes. The bumpy texture in the southeastern extent of the survey area is due to the presence of pillow lavas.